Microsoft Access allows you to store, organize, view, analyze, and share data; the new release enables you to build even more powerful, custom database solutions that integrate with the web and enterprise data sources. This compilation of nine indispensible minibooks is exactly what you need to get up to speed on the latest changes to Access. This easy-to-understand resource provides both new and experienced Access users with invaluable advice for connecting Access to SQL Server, manipulating data locally, getting up to speed on the latest features of Access 2013, creating queries and macros, and much more. From the basics to advanced functions, this book is what you need to make Access more accessible. 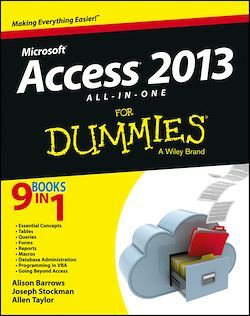 This all-in-one guide offers you access to all things Access 2013!